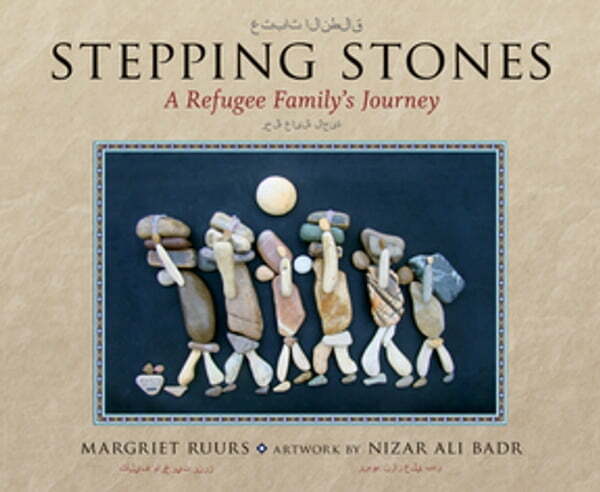 This unique picture book was inspired by the stone artwork of Syrian artist Nizar Ali Badr, discovered by chance by Canadian children’s writer Margriet Ruurs. The author was immediately impressed by the strong narrative quality of Mr. Badr’s work, and, using many of Mr. Badr’s already-created pieces, she set out to create a story about the Syrian refugee crisis. Stepping Stones tells the story of Rama and her family, who are forced to flee their once-peaceful village to escape the ravages of the civil war raging ever closer to their home. With only what they can carry on their backs, Rama and her mother, father, grandfather and brother, Sami, set out to walk to freedom in Europe. Nizar Ali Badr’s stunning stone images illustrate the story. Orca Book Publishers is pleased to offer this book as a dual-language (English and Arabic) edition.